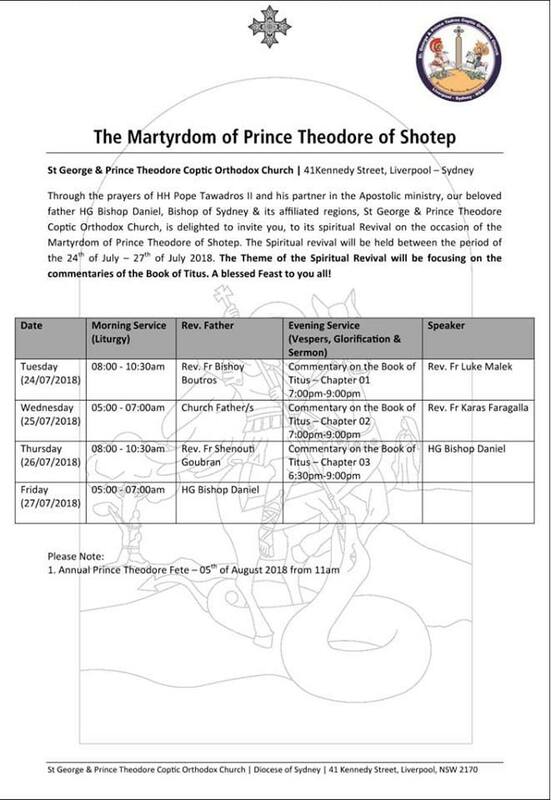 Through the prayers of HH Pope Tawadros II and his partner in the Apostolic ministry, our beloved father HG Bishop Daniel, Bishop of Sydney & its affliated regions, St George and Prince TheodoreCoptic Orthodox Church, is delighted to invite you, to its spiritual Revival on the occassion of the Martyrdom of Prince Theodore of Shotep. The Spiritual revival will be held between the period of the 24th of July - 27th of July 2018. The theme of the Spiritual Revival will be focusing on the commentaries of the Book of Titus. A blessed Feast to you all!